Corinthians Arena in Sao Paulo, Brazil, holds a test match Sunday ahead of the World Cup. One fan who attended said the country "didn't deliver" and isn't ready for the event. Demonstrators in Goiania, Brazil, on Tuesday burn a Brazilian flag in protest of the upcoming FIFA World Cup. After the focus on the many problems Brazil has been facing in advance of soccer's biggest tournament, the South American host nation wants sport to be center stage right now. But to the many fans who attended last weekend, it was obvious that there is still a lot left to be done. "It's completely not ready," said Stanio Silva, a soccer fan attending the game. Only half the seating capacity was used, and only a quarter of the temporary bleachers were tested because they had yet to clear safety checks. The VIP areas were still under construction, too, Silva pointed out. And there won't be a roof for the field. The cost of the stadium? A whopping $450 million. "[I'm] ashamed, of course. We didn't deliver — not just here, but if you go around the country," Silva said. "Let's pray ... it will be a nice World Cup, but we didn't deliver." It may be a nice party, but the World Cup comes with a hefty price tag. This World Cup will be the most expensive ever staged. Even with all the money spent, there are still several stadiums that are unfinished. The infrastructure upgrades — roads, airports, bus and train lines — are in even worse shape: Less than half of what was promised will actually be delivered, and many of the projects are incomplete. Add to that a series of strikes and protests, and it's no wonder the mood in Brazil is grim. A new poll by the Pew Research Center showed that more than 70 percent of people are dissatisfied with the direction the country is headed. Sixty percent now believe the World Cup will be bad for Brazil. You can see that lack of enthusiasm reflected in the dearth of decorations on the streets of many cities. Maria Merces de Paula, who works in a candy shop near one of Sao Paulo's major arteries, said people are unmotivated this year. "For me personally, in other years we would decorate the street, people were more excited. That is not the case this year," she said. There have been many protests staged in this area, and very few shops have any visible displays celebrating the World Cup. De Paula points to a lower shelf that has a small mug with some football-shaped chocolates inside. She says that is the only World Cup-related item she carries. Analysts say there are many reasons for Brazil's mood: The economy is slowing down; the lack of preparation for the World Cup has been obvious. People feel disappointed, and they say Brazil's standing in the world has been hurt instead of helped by the World Cup. So far, the Brazilian government has taken the brunt of the blame. President Dilma Rousseff's ratings have been going down. The stakes for her are particularly high: There are elections in Brazil in October, so there is a sense that if things don't go well, the electorate could punish the incumbent. Brazil's ire, though, has not only been turned inward. FIFA, soccer's world governing body, has also been shouldering a lot of criticism. Rafael Alcadipani, associate professor at Getulio Vargas Foundation in Sao Paulo, says many people feel as though the soccer they loved has been taken away from them because of the demands made by the global soccer organization. "It's not a World Cup for the people, for the regular Brazilians who are crazy about football, who love the Brazilian team," Alcadipani said. "What FIFA has made — especially with those arenas, which are very expensive to maintain — is to create in Brazil a kind of apartheid football, where the blacks will be playing and the whites will be watching it, because the blacks and the poor people cannot access these stadiums anymore." The World Cup was a dream, he says, that has become a nightmare for many Brazilians. Here it comes. Soccer's biggest tournament, the World Cup, starts in a week. All eyes will be on Brazil, the soccer powerhouse country hosting the tournament. You'd think this would be a moment of pride for Brazilians. But, in fact, many Brazilians don't sound that excited at all. NPR's Lourdes Garcia-Navarro is in Brazil's largest city. LOURDES GARCIA-NAVARRO, BYLINE: I am inside the stadium, where the opening game of the World Cup will be played here, in Sao Paulo. 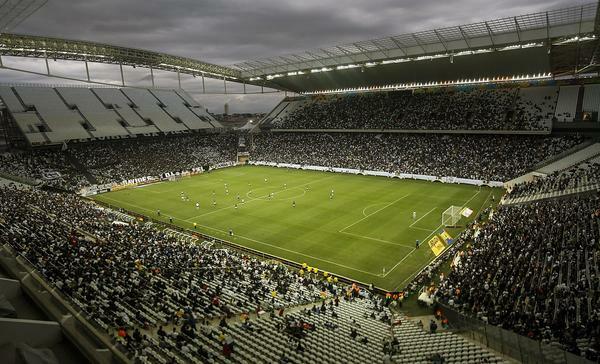 The Arena Corinthians has been one of the most troubled stadiums in the World Cup. There've been massive delays in construction. There've been worker deaths here. And today is the final test match. As you can hear, there are tens of thousands of fans around me, cheering. Brazil wants soccer to be the center stage right now and not the problems that have plagued the run-up to the tournament. But, of course, it's pretty glaring here that there's still a lot left to be done. STANIO SILVA: Completely not ready. SILVA: Ashamed, of course. We failed. We didn't deliver it. That's the point. It's not only here, but if you go around the country, we didn't deliver. Let's pray God is Brazilian. It'll be a nice World Cup. But we didn't deliver. GARCIA-NAVARRO: This World Cup will be the most expensive ever staged. But still, several stadiums are unfinished. The infrastructure upgrades, roads, airports, bus and train lines are in even worse shape. Less than half of what was promised will actually be delivered. And many of them are incomplete. Add to that a series of strikes and protests and it's no wonder the mood in Brazil is grim. 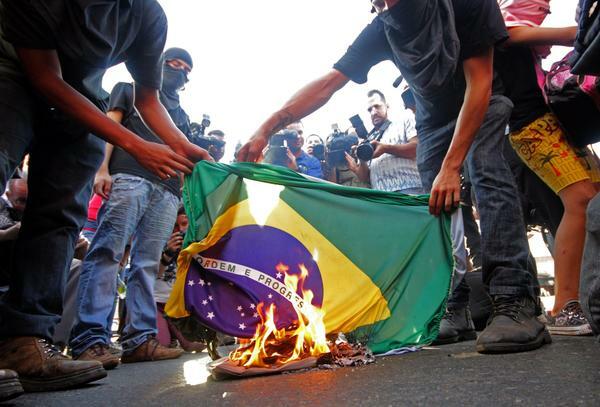 A new poll by the Pew Research Center showed that over 70 percent of people are dissatisfied by the direction the country is headed, 60 percent now believe the World Cup will be bad for Brazil. GARCIA-NAVARRO: So I'm on the street in Sao Paulo. And one of the things that is striking is how few shops have World Cup paraphernalia in their window displays. There's not really an air of celebration, which is really different from other World Cup years, when the city would be painted green and yellow, the colors of the Brazilian flag. MARIA MERCES DE PAULA: (Portuguese spoken). GARCIA-NAVARRO: Maria Merces de Paula works in a candy shop near one of Sao Paulo's major arteries, Faria Lima. There have been a lot of protests staged in this area. And very few shops have any physical display celebrating the World Cup. De Paula points to a lower shelf, where a small mug with some football-shaped chocolates inside sits, and says that's the only World Cup related items she carries. DE PAULA: (Through translator) People are unmotivated this year. For me, personally, in other years, we would decorate the street. People were more excited. That is not the case this year. GARCIA-NAVARRO: Analysts say, there are many reasons for Brazil's mood. The economy is slowing down. And the lack of preparation for the World Cup has been obvious. So far, Brazil's government has borne the brunt of the blame. The president Dilma Rousseff' ratings have been going down. And the stakes for her are very high. There are elections in October. So there's a sense that, if things didn't go well, the electorate could punish the incumbent. Rafael Allcadipani is an associate professor at the Getulio Vargas Foundation in Sao Paulo. He adds that there's also something else rather unexpected that's happening. Many people feel that the soccer or football, as it's known here, that they loved has been taken away from them by soccer's world governing body, FIFA. RAFAEL ALLCADIPANI: What FIFA has made, especially for those arenas, which are very expensive to maintain, is to create, in Brazil, a more - a kind of apartheid football, where the blacks will be playing and the whites will be watching it because the blacks and the poor people cannot access these stadiums anymore. GARCIA-NAVARRO: He says, the World Cup was a dream that has become a nightmare for many Brazilians. Lourdes Garcia-Navarro, NPR News, Sao Paulo. GREENE: Lourdes Garcia-Navarro from our international desk, just one of the NPR correspondents will be covering the World Cup, when it begins. We appreciate you listening to the program this morning on your public radio station. You can follow us throughout the day on the radio, online at Facebook and also at Twitter. You can tweet me. I'm @nprgreene. Tweet Steve, he's @nprinskeep. I sometimes like to tweet him, even when he's sitting right next to me. GREENE: No problem. I'm going to tweet you in just a minute. GREENE: You can also tweet the show @MorningEdition. It's MORNING EDITION from NPR News. Transcript provided by NPR, Copyright NPR.